A well-intentioned, John Ford version of the Sean O'Casey play, with the great director returning to a studio in Dublin, a setting that served him so well in the masterly The Informer. 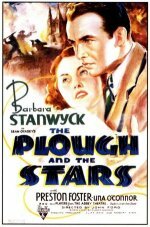 Barbara Stanwyck is magnificently miscast as the loyal wife fearing for the life of her IRA husband, played by the incredibly dreary Preston Foster, and the supporting cast is so authentically Irish that the two leads seem even more at sea. That said, the appearances of performers such as Barry Fitzgerald, his real-life brother Arthur Shields and FJ McCormick go a long way. It's truly dispiriting to watch a major Irish play sink into the Hollywood mire, particularly since Ford should have known better, and the cheap production values and ill-chosen intercut newsreel clips don't help.